AATE offers numerous and varied opportunities for companies and organizations in the educational, theatrical, entertainment, and publishing trades to regularly reach our targeted and highly engaged audience. Download our Conference Prospectus for full details. 78% of our members are professionals working in the field as youth theatre directors, college/university theatre educators, or K-12 theatre teachers who stage productions during the school year. These artists and educators are the primary purchasers of theatrical supplies, including plays, books, costumes, sets,technical equipment, and more. 64% of our members are advisors to students who are considering further theatre education at conservatories,colleges, universities, and other institutions. AATE.com is the website for the American Alliance for Theatre & Education and the place where anyone interested in theatre and education comes for information. AATE.com has partnered with MultiView to provide advertising opportunities on the AATE Website. Ads appear in the bottom right corner of the AATE homepage, as well as all pages, to increase awareness of your products and services. For more information about advertising, email [email protected] or call 972-402-7070. The 2018 Conference, "Rise Up,” will take place in Minneapolis, MN, August 2-5, 2018. We expect over 400 people to join us, attending events that include workshops, panels, performances, keynote speakers, networking events, receptions and discussions that encourage reflection on successes and challenges in the field and facilitate the setting of goals for the future. Every attendee has access to our digital conference program through the Guidebook app. 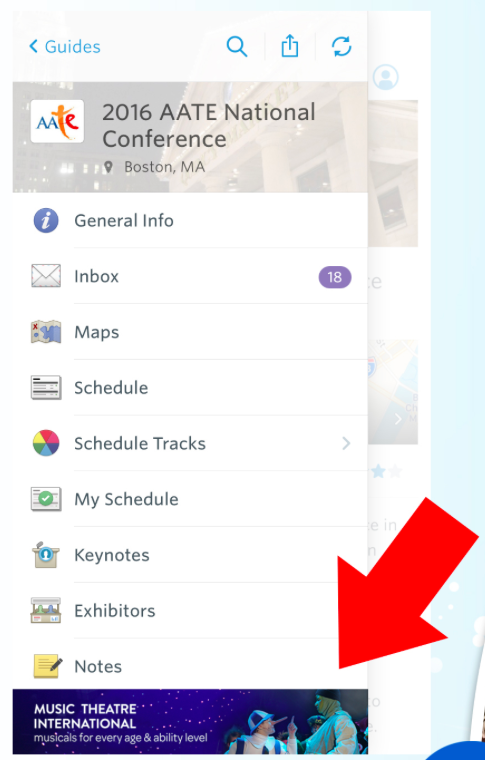 The Guidebook app is something that attendees refer to frequently while at Conference. They use this app several times a day to plan their conference experience. We offer ad placements in our Conference Guidebook. Your ad will rotate at the bottom of the main menu page of the app, maximizing your exposure in the banner of the Guidebook. We also offer rotating advertisements during Conference. The ads are projected and at the registration desk and in all Conference events. For sizes, specs and rates, head to page 5 of the Conference Prospectus. One of the highlights of every AATE National Conference is the exhibit hall. Our exhibit hall is unlike any other as it is small enough that attendees get to spend time at every booth yet large enough to give attendees access to a wide array of products and services. In addition, we arrange for incentives for attendees to visit each booth such as our exhibitor reception and "Trivia Scavenger Hunt” promotion. Exhibits are located on the conference floor where most all‐conference events and food/coffee will be located. Exhibitors therefore have a unique opportunity to interact with delegates as they move through the conference areas. The exhibit hall is open for the first two days of Conference to give maximum exposure within a limited time frame. For Exhibit Booth rates and details, head to page 4 of the Conference Prospectus. View our Conference Prospectus for full details. Incite/Insight is AATE's digital magazine for theater education professionals, by theater education professionals. AATE allows the members to dictate the topics of each issues through feedback and contributions, and then sharing it out with the rest of you. Download the Incite/Insight Prospectus for more information. Pay and reserve a space in the publication today. Click HERE.